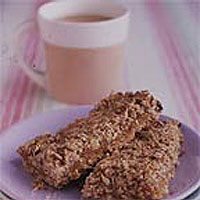 Serve these warm as a dessert, with a dollop of fresh or frozen yoghurt; or cold, cut into wedges with tea or coffee. If you want to reduce the fat content, use 2 tbsp sunflower oil instead of the butter - though this will make the biscuits more crumbly. Preheat the oven to 190°C/gas mark 5. Grease a 20 x 30cm swiss roll tin. Simmer the apricots in 150ml water until soft (approximately 10-15 minutes), then remove from the heat and mash to make a thick purée. Leave to cool. Put the flour and oats into a bowl and rub in the butter with your fingertips until the mix resembles coarse breadcrumbs. Add 2 tbsp water and mix well, then press half the mixture into the greased tin. Spread the puréed apricot on top, then sprinkle the rest of the oaty mixture over. Bake for 30 minutes. Cool in the tin, then mark into sections and remove carefully with a spatula (the slices will be rather crumbly).